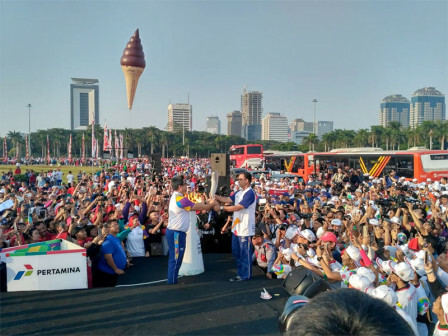 Jakarta Governor, Anies Baswedan receives Asian Games 2018 Torch which is handed over from Inasgoc Deputy II, Francis Wanandi at the western side of Monas, this Saturday (8/18) morning.
" We should be proud to be a part of this event"
Then, torch is handed over from Anies to Jakarta DPRD Head, Prasetyo Edi Marsudi to be paraded across several roads that lead to Gelora Bung Karno. "Thanks God, we have started the final stage of this eternal flame's journey. It is departed from Monas," he expressed. According to him, Asian Games 2018 event in Jakarta is a form of world trust to Indonesia for hosting the largest sport event in Asia. Thus he encourages all people to maintain this trust. He asked for supports and prayers from all communities thus the event can run successfully and smoothly. He also encourages Indonesian athletes to give their best in this event for Indonesia. "In competing, don't you ever feel alone. There are people who are always support and pray for you whenever you are competing," he stated. As a Jakarta Governor, he reminds Jakartans to be a good host by greeting and giving assistance to foreign people, athletes, or officials who need it. According to him, hospitality will leave a good impression for foreign visitors towards Jakartans. "We should be proud to be a part of this event and I believe your support will be very meaningful for the organizers and our athletes," he affirmed. For information, Asian Games Torch Relay in Jakarta is scheduled to start from Monas - Arjuna Wijaya Statue's dancing fountain - Jl. Sarinah Thamrin - Bundaran HI - Jl. Sudirman - Senayan Gate 1 - Jl. Asia Afrika (U-Turn) - and ended by entering GBK at 11 AM.